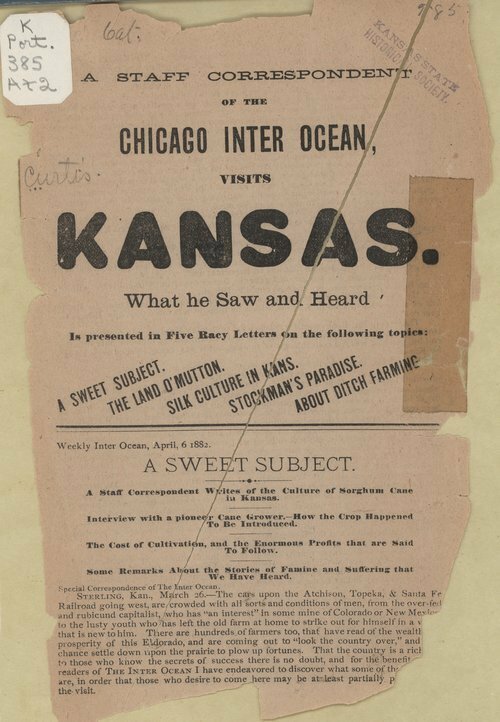 One of a weekly series of booklets titled "The Inter Ocean" published by the Atchison, Topeka and Santa Fe Railroad to promote the settling of Kansas. The topics in this eight page booklet include A Sweet Subject (sugar cane), The Land O'Mutton, Silk Culture in Kansas, Stockman's Paradise and About Ditch Farming. A farm of one thousand acres could be purchased from the Atchison, Topeka and Santa Fe Railroad for $6,000 on eleven years time.